Nancy Kochenower’s Blog Frills, Frocks, or Khakis Sans Socks? Frills, Frocks, or Khakis Sans Socks? Tips on dressing your child for the portrait photoshoot…. If you’re like most parents you want everything to be perfect the day of your child’s portrait photoshoot. His clothing, her hair, the venue, even your child’s mood is often of concern as you prepare for the big day. The good news is that getting ready for the photoshoot is probably going to be a lot simpler than you’d imagined. So let’s take a few minutes to focus on one of the first concerns you may have; the matter of getting your child’s clothing together for that time. Whether you’re wanting to portray your child at her dressed-up best or in casual attire is more than likely your initial consideration. If you have trouble making that decision the simplest solution is to have your child photographed in a dressy outfit and also in more casual clothing. Then when you view the photos of her dressed both ways you’ll have a much better idea of which one you find more appealing. Let’s go ahead and take a look at some of the elements that come into play when choosing clothing for your son’s or daughter’s portrait photoshoot. Portraying the young child with bare feet is often desired as those little toes are undeniably cute. So why not show them off while they’re still sweet as can be! There are times, though, when common sense would dictate the wearing of shoes, such as when the weather is cold or when the child is portrayed engaged in a sport or activity where shoes would be essential. For an older child often the portrait will show just three-quarters of the figure so that shoe choices don’t enter into the equation. However, if the feet are showing, as is sometimes the case, a judgment call can be made for shoes, boots, sandals or bare feet based on what the person is wearing in the photograph and how she wishes to be portrayed. Quite a few girls of all ages are photographed in full or tea-length dresses for their portraits. However, I’ve painted some young ladies in shorter dresses or skirts, slacks outfits, or blue jeans with t-shirts, too, for a casual look that is also appealing. Often parents are choosing to have their sons of all ages photographed in khaki shorts or trousers while wearing a long-sleeved oxford shirt with sleeves rolled up. This gives the appearance of being dressed up yet laid back in the same photo. For warmer weather a polo shirt may be chosen. The blue jeans and t-shirt look is also a classic clothing choice. Sometimes parents prefer more formal clothing for their son and that’s a great portrait look, too. Whites and light blues for dresses and shirts are the most popular color choices for clothing for all ages of children and young people in their portrait photographs. Khakis, navies or blue jeans are also classic pant or skirt choices that won’t look outdated in years to come. Pink and red are lesser chosen colors for shirts or dresses but I’ve painted some wonderful portraits with girls or boys wearing those colors. If you’d like for your child’s portrait to be painted portraying him in dark clothing, such as navy or black, you may want to have him photographed in a lighter color since details and folds in fabrics of dark colors seem to disappear when photographed. 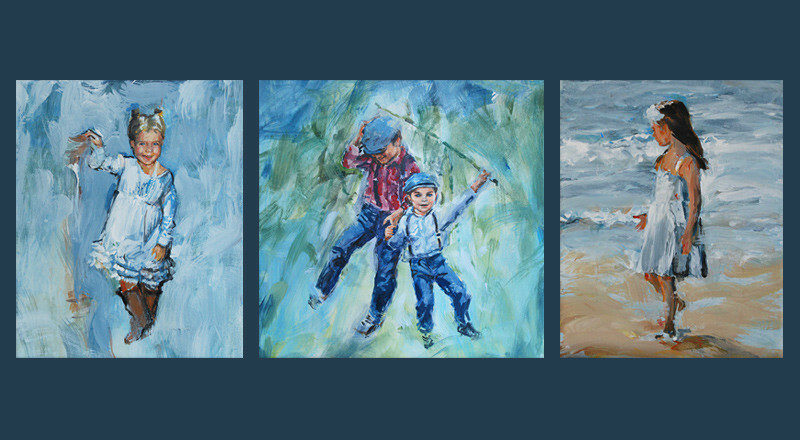 When it comes time to paint the article of clothing can be painted in the darker color you prefer, even if your child has been photographed in a light color. Of course, the choices for fabric colors and clothing styles are ultimately your decision to make; however, I’ve found that most of the time solid-colored fabrics suit portraiture better than printed fabrics do. I would also advise that classic clothing styles are usually more timeless than trendy styles. If you have a printed article of clothing that fits your child very well or an article of clothing in a style you like but in the wrong color, I can photograph her in it and paint the clothing as if it were white, blue, or whatever your choice may be. This works well and may save you from taking the time to shop for an article of clothing in the style you prefer. It’s usually not possible to paint the style of an article of clothing differently in the painting, although a skirt or pair of shorts can be lengthened in the portrait but not shortened. On the lighter side, if you can make it to the day of the photoshoot without having had your young child find a pair of scissors and chop out a chunk of his hair you’re doing great! If you happen to take your child in for a haircut and too much is trimmed off, don’t despair! Longer hair can be painted in. It’s not as easy to shorten hair, though, but can be done sometimes. That said, the above suggestions are guidelines and there are no rules as to what your child must wear for the portrait photoshoot. Your opinion as to their attire is most important. If you have questions about your child’s portrait attire, or any other aspect of portraiture, that I haven’t addressed please feel free to leave a reply and I’ll comment as soon as possible. Thank you, travel! Glad to have you visiting and please do tweet website to your followers! Be my guest in sharing my blog with your twitter group, free! Glad you’re enjoying the site! You may contact her via the form on the Contact Page, or you can reach her at 864-585-7021.